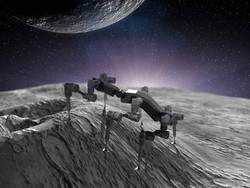 On this page you will find a selection of space technologies that have been developed by the space and robotic institutions involved in ROBEX. 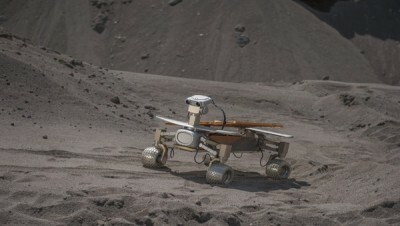 Asimov Jr. R3 was developed in collaboration with DLR and the PTS GmbH for the “Google Lunar X-Prize”. Its dimensions – 60 centimetres in length, 40 centimetres in width, 50 centimetres in height and a weight of roughly 29 kilograms. DLR contributed the propulsion technology that was successfully demonstrated between 2005 and 2010 on ROKVISS, a robot arm mounted on the exterior of the ISS. Its autonomous navigation, based on semi-global matching (SGM) environmental perception technology is a special task of Asimov Jr. R3. All the human operator must do is indicate a few target points in the camera image; the rover then finds its way to these target points safely, autonomously and without prior knowledge of the surrounding terrain. This technology, developed by DLR, is needed because the long signal transmission times when controlling space robots remotely can be very cumbersome and entail a high risk of the rover getting stranded in relatively impenetrable terrain. 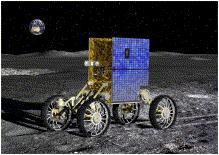 The MPE is outlined to be a small, autonomous, innovative vehicle in the 10 kg class for scouting and sampling the environment in the vicinity of the lunar landing site. The novel capabilities of the MPE will be to acquire samples of lunar regolith from surface, subsurface as well as shadowed locations, define their geological context and bring them back to the lander. This will enable access to samples that are not contaminated by the lander descent propulsion system plumes to increase the chances of detecting any indigenous lunar volatiles contained within the samples. 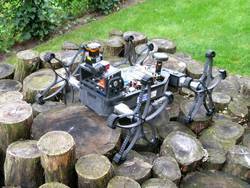 The robot „SpaceClimber“ project will prove that legged systems present a very suitable solution to future extraterrestrial missions in unstructured, uneven terrain, in particular in crater and crevices in the rock. The robot system to be developed will be able to safely control up to 80 % non-uniform grades. Local autonomous navigation will be possible due to special sensor technology and new software algorithms for slope navigation. Thus, in the field of planetary mobility, a technology will be developed which will make future crater and canyon exploration possible. Special emphasis is given to robustness, energy efficiency, redundancy, and autonomy of the robot. The most important component to reach these goals is the actuators for the locomotor system. Hence, intelligent, lightweight, powerful and energy efficient joints have been developed for the system. As high stability in steep terrain is of utmost importance, the development and realization of novel feet concepts play an important role in the SpaceClimber Project. In the future humanoid robots are envisioned in household applications as well as in space environments. The capability to carry out complex manipulation tasks is a key issue. The mobile robotic system Justin with its compliant controlled light weight arms and its two four finger hands is an ideal experimental platform for these research issues. 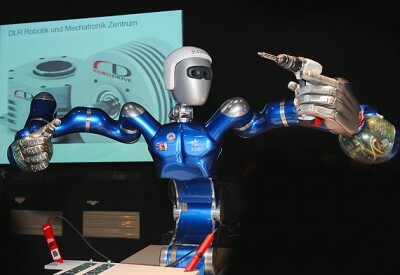 PMD sensors and cameras allow the 3D reconstruction of the robot’s environment and therefore enable Justin to perform given tasks autonomously. For planetary exploration as well as for search and rescue missions on Earth groups of hexapedal walking robots seem to be a promising alternative or support to wheeled and tracked vehicles. 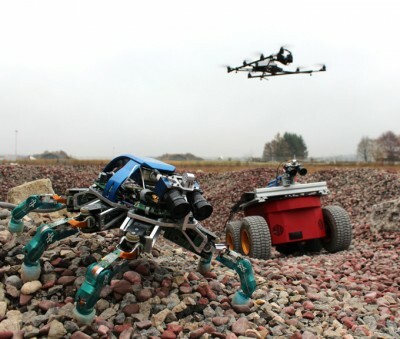 In this context, the DLR Crawler is a first laboratory prototype that is built to investigate the capabilities of hexapedal walking. Thus, it serves as a testbed for the development and evaluation of different control, gait and navigation algorithms. The experience gained with the DLR Crawler will be a valuable guide for the development of future hexapedal walking exploration robots. The DLR-RMC test facility PEL (Planetary Exploration Lab) consists of an indoor soil bin with specific high precision measurement systems. The facility is used to reproduce planetary surface topologies in order to demonstrate vehicle navigation tasks, to produce high resolution surface models and to run tests under nominal and critical driving manoeuvres. Thereby, verification of computer generated simulation models plays a major key role. 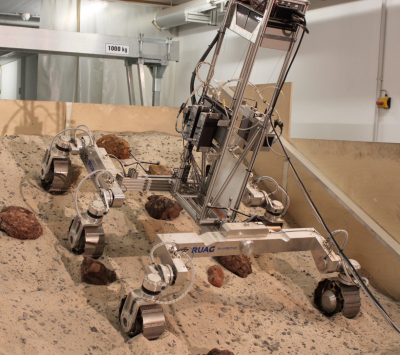 Mainly, the facility simulates very flexibly the planetary surface of interest: for vehicle mobility investigations, different terrain types can be reproduced while using diverse soil materials such as soft sandy soils, pebbles, stony material or even big rocks as obstacles. To also reproduce inclined terrains, e.g. in crater-like regions or going up- or downhill, part of the soil bin can be tilted by an angle of almost 30o. Furthermore, the facility is equipped with two different measuring systems: one such optical system allows the test area mapping by generating 3D elevation data, e.g. in order to integrate the 3D data within a computer simulation. A second optical system then detects the position and orientation of the driving vehicle. Since the indoor experimental conditions are always reproducible, this allows to compare measurement data of various driving manoeuvres with each other, as well as with computer simulated results. This guarantees high reliability in predicting vehicle driving performances for real operational mission cases. The facility is complemented by two more test rigs: One rig is a so-called Bevameter (Becker Value Meter) to determine the soft soil physical characteristics, and a second rig is a single wheel test facility that determines the traction forces under controlled slip conditions of specially designed and optimized wheel geometries.